Head due west from the centre of Inverurie and once beyond the A90 bypass you find yourself on increasingly minor roads that climb gently uphill. Follow the tourist signs and you end up in a small car park, from which field tracks continue uphill to East Aquhorthies Stone Circle. What's in a name? Traditionally this place was usually known as "Easter Aquhorthies Stone Circle" even though the nearby farm is called East Aquhorthies. More recently it's undergone a revision of name, and Historic Environment Scotland have taken to calling it "East Aquhorthies Stone Circle". We have followed suit, though you'll see it referred to by the old name in many places. 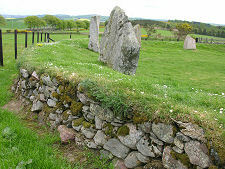 What you find is one of around 90 recumbent stone circles to have survived in Aberdeenshire. 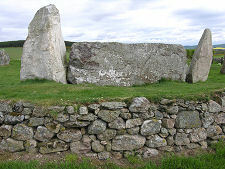 The name comes from their common feature, a focal point on one side of the circle formed by a stone laid horizontally (or recumbent) flanked by vertical stones. 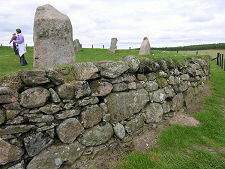 These circles arrived in the Aberdeenshire landscape during the centuries around 2000BC, though at East Aquhorthies the raised embankment that surrounds the stones, whose outer face is retained by a dry stone wall is thought to be a relatively recent addition, perhaps being constructed in the 1700s or 1800s. 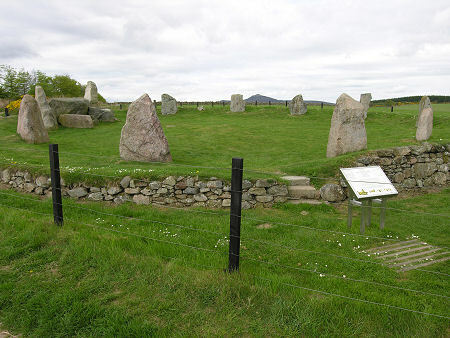 The stone circle at East Aquhorthies measures some 19.5m in diameter, and is close to circular in plan, probably making it one of the earlier stone circles to be built in Aberdeenshire. The builders of many of these circles chose superb locations for them. Easter Aquhorthies is no exception, and it offers extensive views to the east. 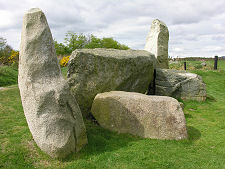 The recumbent stone measures some 3.8m in length and is thought to weigh around 9 tons. It is made of reddish granite that was probably brought here from Bennachie, a mountain a few miles to the west. The flankers are made of grey granite, some 2.3m height. Two large blocks project into the ring from the recumbent stone, making this side of the ring feel even more than usually "altar-like". 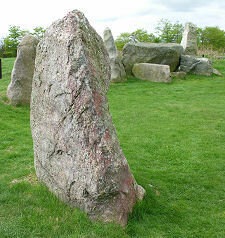 Most of the individual standing stones in the circle are made of porphry, a reddish rock. There is one exception, a rock made of a hard substance called jasper. They decline in size from about 1.8m high next to the flankers to 1m on the opposite side of the circle. The centre of the circle rises slightly, and it is thought this could indicate the site of a ring cairn. When you visit a stone circle like East Aquhorthies, you inevitably begin to wonder how and why a people who were probably fully occupied simply feeding themselves and their families should have had the desire, or the resources, to construct on such a large scale. 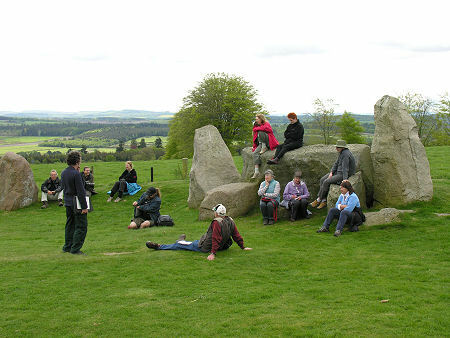 No-one who has ever visited a stone circle would deny that there must have been something very spiritual about their role. 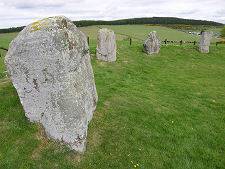 It has also been suggested that at least some of Aberdeenshire's recumbent stone circles had roles in acting as a lunar calendars, allowing accurate identification of different parts of the farming cycle. Across Aberdeenshire, stone circles have met with a variety of different fates over the millennia which have elapsed since they were built. Some doubtless disappeared without trace, while others remain in only fragmentary form. At East Aquhorthies it seems that the spiritual value of what the ancestors built carried a power that has influenced people ever since. The protecting embankment and wall can be seen as a sign of this. 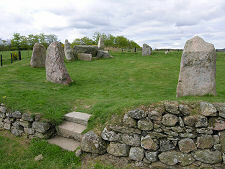 Another is in the very name of the stone circle itself. 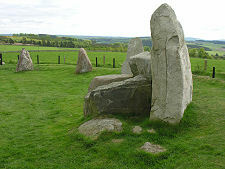 "Aquhorthies" probably comes from the Gaelic, but opinions differ as to whether it means "Field of Prayer" or "Field of the Pillar Stone". Either way it suggests a continuing consciousness of the stones. Open all year and admission is free.